Okamura Yasutsuga (Okamura Yasuji according to some sources) was born in Kyoto prefecture and graduated from the Japanese military academy in 1904. He graduated from the Army Staff College in 1913 and served on the General Staff during the First World War. Together with Nagata Tetsuzan, Obata Toshishiro, and Tojo Hideki, Okamura helped organize an informal study group of field-grade officers that became the One Evening Society in May 1929. Okamura, Nagata, and Obata had served as military attachés in Europe and were impressed with Ludendorf's philosophy of total war, and the One Evening Society subverted the admissions process to the Staff College to reduce the influence of the conservative Choshu clan. Okamura was a military adviser to a Chinese warlord during the 1920s and was deputy commander of Shanghai Expeditionary Army in 1932. In his memoirs, he admitted to playing a leading role in beginning the comfort system while posted to Shanghai. Later he served in several staff positions with Kwantung Army. As commander of 11 Army in 1938, he advocated renewed ground offensives to destroy the remaining Chinese armies as the only way out of the China Incident. Attacked by a Chinese counteroffensive in December 1939, his forces were then scattered and lacking reserves, but regrouped by January 1940 and defeated the Chinese offensive. 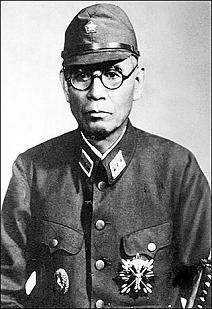 Okamura was given command of the North China Area Army in July 1941. During his time as commander he instituted the Three Alls Policy ("Kill all, burn all, loot all"). He commanded 6 Area Army from August 1944, and became commander of China Expeditionary Army in late November or early December. He launched the massive Ichi-go offensive against American airfields in southern China in May-November 1944, which was largely successful in its objectives. Such a disgrace as the surrender of several million troops without fighting is not paralleled in the world's military history, and it is absolutely impossible to submit to unconditional surrender of a million picked troops, in perfectly healthy shape, to the Chungking forces of defeated China. Things did not turn out that way, and he surrendered to Chiang Kai-shek at the close of hostilities. A fervent anti-Communist, he would remain in China to advise Chiang (who absolved him of responsibility for any war crimes) until 1949, when he returned to Japan and helped create the Self-Defense Forces.